An angiogram is a procedure your doctor may recommend, to assess whether there are narrowings in the arteries that supply blood to your heart. Additional information can be obtained about the pump function of the heart, whilst direct measurements of pressures in heart chambers is possible. The procedure itself is not lengthy and normally lasts between 20 and 30 minutes. It is minimally invasive and completed through a very small hole either in the wrist or the groin. When you present for an angiogram you will usually be asked to change into a hospital gown. Prior to the procedure you will have your blood tests checked and a small drip (cannula) inserted, through which medications can be given. Your doctor will complete a consent form with you, which offers an opportunity to discuss the procedure in more detail and ask any questions. If there is anything you would like to know, do not be afraid to ask as the staff are there to help. The procedure takes place in a cardiac catheter suite which consists of a room with a table in the centre. X ray equipment sits next to the table and is able to move around at different angles. This allows pictures of the blood vessels to be taken from different orientations, which is important to appreciate all the bends and twists in the arteries. There are monitoring screens that display your blood pressure and heart rhythm along with pictures of the blood vessels. Various staff are present, who all play key roles during the procedure. These include nursing staff who manage medications, organise equipment and assist the doctor, radiographers to operate the X ray equipment and cardiac physiologists who monitor your blood pressure and heart tracings. The procedure is performed by a cardiologist who leads the team and is able to explain the findings of your test to you. At the start of the procedure, the staff will introduce themselves and you will be asked to lie down on the table in the catheter lab. The area of access (wrist or groin) is cleaned with an antiseptic solution to prevent infection and a large drape is placed over your body. The drape has a small hole in it, which is placed over your wrist or groin, through which the procedure can be performed. This preserves your dignity although your face is not covered and you are able to talk to the doctor during the test. If you are interested, you may be able to see some of the pictures of your blood vessels, although you certainly do not need to look if you would prefer. Many patients choose a mild sedative to relax them, although the procedure is performed in many institutions without sedation as it is minimally invasive. Dr Butts prefers to administer sedation unless patients do not wish, as it not only aids relaxation, but helps prevent constriction of blood vessels in the arm and heart allowing easier acquisition of high quality pictures. As a high volume radial (wrist) operator Dr Butts performs most of his procedures from the right arm. Patients often prefer this as they are able to sit up and walk around freely soon after the procedure. Despite this, in a minority of specific cases the procedure is best performed from the groin or the left wrist. Alternative routes are particularly relevant when people have had previous bypass surgery and additional pictures of their grafts are needed, or if the blood vessels in the wrist are very small. Whichever route is required Dr Butts has lots of experience having performed thousands of procedures. Local anaesthetic is placed in the wrist (or groin) which makes the area very numb. Once the anaesthetic has taken effect a small tube is placed into the artery which acts as a port, through which different catheters (small thin tubes) can be exchanged. They often pass easily through the blood vessels to the heart from the wrist (or groin) over a soft tipped guidewire which is passed up the blood vessel. It is common for operators to administer medication in the wrist to dilate the blood vessels, making them larger. This medication often gives people a sensation in their forearm which some describe as a warm or cold feeling. It tends only to last for around 20 seconds or so.The catheters are engaged with the arteries to the heart and pictures are obtained by the operator injecting contrast fluid through the end of the catheter at the wrist or groin. The contrast shows up very well on an X ray and travels down the coronary arteries, giving very clear pictures of the blood vessels. While the cardiologist is taking pictures of the blood vessels, they may ask you to take a deep breath in or out. Many pictures of the heart can be obtained without any special breathing manoeuvres and if you have not been asked to do anything then just breath normally. Most people are unaware of the movement of the catheters in their body but some people do notice a sensation in their chest when the contrast (dye) is injected. This is not normally uncomfortable, but if patients understand that it can occur, then they are less likely to be worried if they experience it. Some people do notice a warm flushing feeling in their body when contrast is injected and some people feel a sensation of wanting to go to the toilet or a metallic taste in their mouth. These are not worrying signs and if you notice them and are concerned then do mention it to the doctor who will reassure you. Despite all of this, many patients are surprised how quickly the procedure is performed. As with many procedures the thought of it is often far worse than the actual experience. Once the pictures have been obtained, the catheters are removed along with the tube in the wrist (or groin). A compression device is used for 1-3 hours to press on the blood vessel and prevent bleeding whilst it heals. At the wrist this is often a small band or bracelet and you are able to sit up in bed as soon as you arrive back from the procedure. In the groin there may be a belt like device that presses on the access site and due to the location, you may need to lie flat for a period of time. Gradually these devices are released and then removed. Sometimes the operator will use a sealing plug, delivered inside the blood vessel to close the small hole. 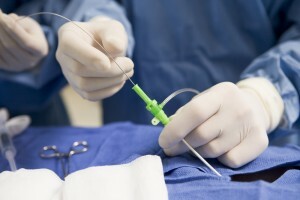 This is performed in the catheter lab under X ray guidance and the plug dissolves naturally over a number of weeks. This is good for some patients but not suitable for all cases. While you are relaxing after the procedure you will often be offered food and a drink. The nursing staff will need to check your blood pressure periodically and may continue to monitor your heart tracing and heart rate. This is not a cause for concern but normal practice after an angiogram. Do not be alarmed by the attention you are receiving. A little later once other cases have been completed, the doctor will come and explain the findings and answer any questions you may have. National Heart, Lung and Blood Institute: What is coronary angiography?